Make your own sale with some discounted gift cards from Canadian Tire. 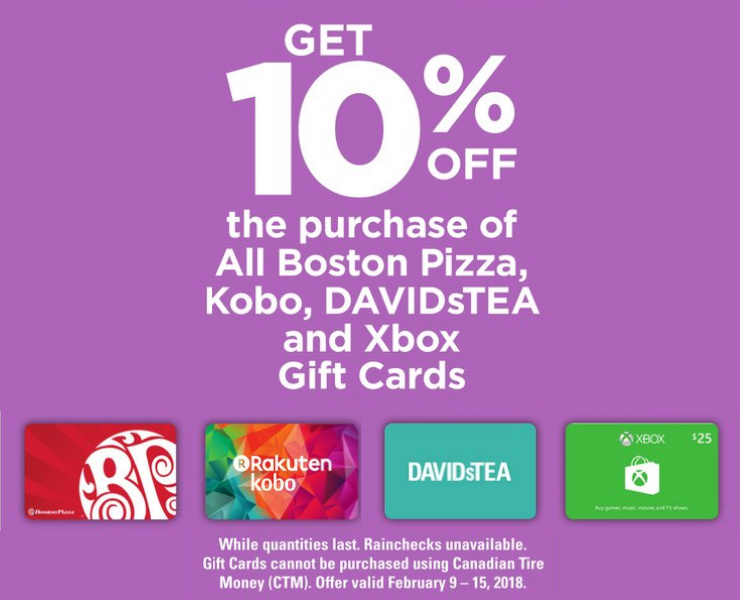 Starting on Friday 9th February, save 10% on all Boston Pizza, DAVIDsTEA, Kobo and Xbox gift cards. Many Canadian Tire stores do not have large racks of gift cards, so a good idea to shop early. With Valentine’s Day, people are more likely to be shopping for gift cards. There is no minimum limit on the value of the gift cards, but many stores will only sell $50 cards. There is also no limit, but stores can limit purchases due to fraud if not paying cash. While the cards offered this week are fairly specialized, if you will use them, always good to buy them at a discount. The flyer for Canadian Tire should be available soon in our flyer section. is there taxes when you buy a giftcard?